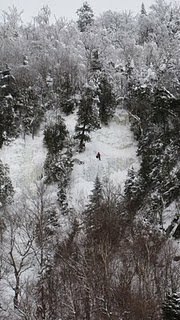 Early ski season – December in this case – can be a challenge not only for Adirondack backcountry skiers but also for those of us who write about the Adirondack outdoors.This year is no exception. As your faithful Adirondack outdoor recreation specialist, I am also a stickler for journalistic integrity. I planned to write a well-informed report about current backcountry ski conditions for yesterday's column, so a reconnaissance ski was in order. That research revealed borderline backcountry ski conditions; rocky and slushy areas due to thin snow cover. I therefore wrote a timely and very nice report about the importance of knowing where in the Adirondacks to ski off-track in low snow conditions. That report, scheduled to post yesterday, was delayed until today due to internet connectivity issues. Then we received 10 inches of lovely, fresh new snow overnight!!! Fortunately, my recommendation for a short, holiday weekend appropriate, Adirondack backcountry ski excursion in today's great snow conditions, or in yesterday's low snow remains the same: ski the Jackrabbit Trail from Lake Placid to Keene. This 3-mile section of the spectacular Jackrabbit Trail climbs up from Lake Placid, through the narrow valley that separates the back side of Pitchoff Mountain from the Sentinel Range, down to Keene, New York. 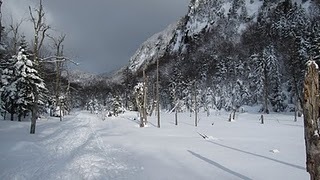 An advanced intermediate ski, the ski trail passes through steep, narrow rocky sections, and over frozen beaver ponds. While this particular part of the Jackrabbit Trail is my personal favorite for aesthetic reasons, the climb is also a good way to get warmed up and provides a nice aerobic workout. I usually go as fast as possible on the downhill sections, but yesterday's conditions called for caution on all counts. Skiers this weekend will find the fresh snowfall has turned yesterday's snowplow into tuck-n-go technique, although there are those who make cute telemark turns just for the sake of cute telemark turns. The beauty of wonderful fresh snow cover is that whatever floats your ski, works! Skiers who reach the top beaver pond and are paying attention can usually spot the ice climbers on Pitchoff Mountain. Don't be unsettled if you've been skiing along in the marvelous snowy silence and you suddenly hear voices echoing off the cliffs with no one in sight. If you pause and look closely, you'll discover the voices are coming from those tiny specks of human, hanging onto the frozen waterfalls on the nearby cliffs. Shortly after crossing the large beaver pond the trail climbs to the height of land. Skiers can enjoy an immensely fun descent into Keene to Adirondack Rock and River, or turn around and ski back to their starting point. To get to this section of the Jackrabbit Trail, drive out of the Village of Lake Placid on NY State Route 73 for about 4 miles. Make a left turn on Mountain Lane and drive a mile to the end of the road and the start of the ski trail. Happy Holidays – ski, ski, ski!